As a parent, I want to encourage my daughters to be engaged, responsible and respectful. It is important to learn about politics, to vote responsibly, to take part in our democracy. At home, we talk about the importance of being open minded and not jumping to assumptions or spreading rumors. Staying informed is an important responsibility. I also want my kids to know that they can do anything they set their minds to, if they apply themselves with grit and determination. Yesterday, Hillary Clinton made history becoming the nation's first woman nominated as the presidential nominee of a major US political party. My daughters are clearly aware of the impact of this moment--but I wonder how they get their news. Buzz Feed? Or the New York Times? As parents and teachers, we need to show children that they can learn about a nominee's background so that they don't just mimic political slogans but rather have substance to support their views. 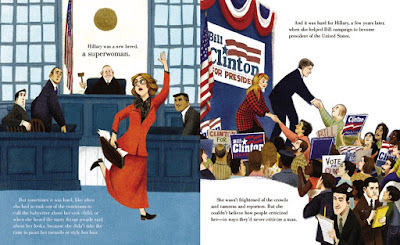 For children ages 6-10, I'd highly recommend two resources: Michelle Markel's picture book biography Hillary Rodham Clinton: Some Girls Are Born to Lead, and the news coverage on the Time for Kids' Election 2016 mini-site. 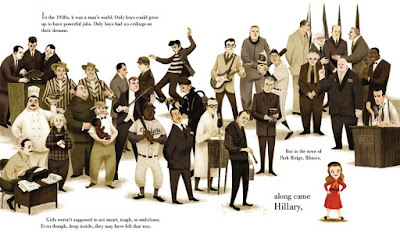 Michelle Markel and LeUyen Pham bring upbeat energy and thorough research to this engaging picture book biography of Hillary Rodham Clinton. They give a clear sense of her challenges and accomplishments, and also help young readers see Clinton’s life in context. "In the 1950s, it was a man's world...But in the town of Park Ridge, Illinois along came Hillary." Kids will relate to many of the qualities and situations that Markel describes--from her youth to her political challenges. 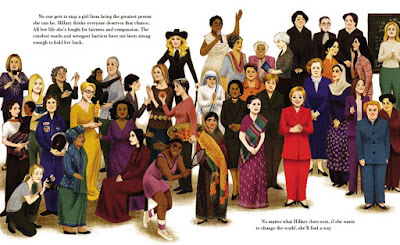 Markel concisely traces Hillary's path from law school through her position as U.S. 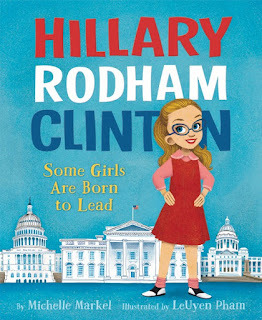 Senator, giving young readers a sense of both her achievements and her drive. "She wasn't frightened of the crowds...But she couldn't believe how people criticized her--in ways they'd never criticize a man." "No one gets to stop a girl from being the greatest she can be. Hillary thinks everyone deserves that chance." For election coverage, I stress that kids need to gather information from a variety of sources. I'm sure they'll hear snippets from friends, but they need to make a point to read more than the eye-catching headlines on BuzzFeed. I've been particularly impressed with the balanced coverage on Time for Kids' Election 2016 mini-site. They have covered both Republican and Democratic conventions. They have introduced all of the major presidential and vice-presidential candidates with short, informative articles. Kid reporters are sharing their experiences at the conventions. I must say that I have been very disappointed that some other kids news sites I share with students, especially Newsela and Dogo News, have not covered the national political conventions this summer. It will be interesting to see how they decide to cover the race, especially as it increases in rancor this fall. Illustration copyright © LeUyen Pham, 2016, shared with permission of the publisher. Many thanks to HarperCollins for sharing a review copy. If you make a purchase using the Amazon links on this site, a small portion goes to Great Kid Books. Thank you for your support. Summer brings a chance for all of us, especially children, to revel in playfulness. Some of my favorite moments are watching kids read and play with Hervé Tullet's terrific picture books: Press Here, Mix It Up! 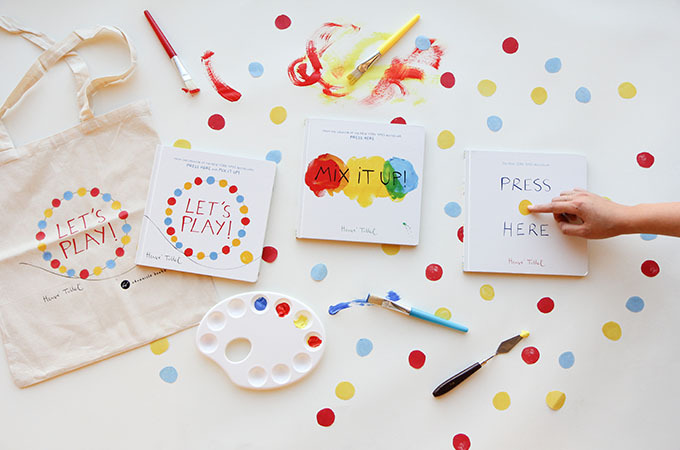 and Let's Play! Press Here enraptured my youngest daughter when she was in 1st grade, and was a real part of her reading journey. She read it over and over again--precisely because Tullet showed her that she, the reader, was essential to the story. Have fun watching Tullet read Press Here aloud with the delightful Rocco Staino for KidLitTV. With the cacophony of political noise this month, some of it truly disturbing, I find myself wanting to escape into books--much like my friend Donalyn Miller described in her NerdyBookClub post today. Many thanks to Hervé Tullet for sharing his playful energy and fresh spirit to lighten my days. Many thanks to the publisher, Chronicle Books, for sharing review copies. If you make a purchase using the Amazon links on this site, a small portion goes to Great Kid Books. Thank you for your support. I've been thinking about the power of poetry lately, how it helps us share our stories, reflect on emotions and have room for our own experiences to meld with author's ideas. Yesterday, Kwame Alexander was interviewed on NPR about his reflection on talking about the tragedies of last week, with the police shootings. His comments have stayed with me today, and I'd like to share them with you. 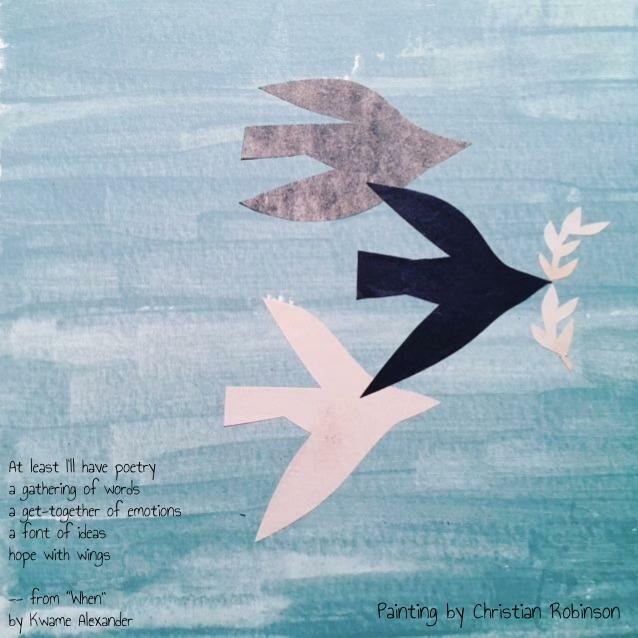 Below I've paired Kwame Alexander's words with a beautiful painting that Christian Robinson, an artist whose work I admire deeply, shared this week. Today I visited the 9/11 Memorial, a powerful combination of historical site and memorial to honor those who were killed. I was struck by how much the New York community came together during this crisis to help each other. As I think about the tragedies of last week and talking with students, I want to honor the emotions of fear and anger caused by police brutalities. I also want to help our children see a positive way forward, to think about the world they want to help create, and how they want to respond to difficulties. The 9/11 Memorial has an incredible education division. I'd like to share here a poem they present to children who come to visit the museum. It's called The Survivor Tree; it tells the story of a tree at the World Trade Center that was severely injured but was nurtured back to life. It's a beautiful poem, performed by Whoopi Goldberg. There is a storm raging around us. We have to acknowledge this, bear witness AND hold a torch to create change. I am convinced that books help light the way, both in our souls and in our communities. We must take on this work and speak up for change. Grief and outrage, a combination of intense sadness and overwhelming rage have been swirling together as I've tried to process violent, disturbing news over the last month. I know that this is my space for sharing books for children. I also need space to bear witness to the crisis our society is facing, and to frame my work as a librarian in light of this crisis. Police brutality and institutional racism are disturbingly intertwined. This week in Louisiana and Minnesota, two black men were shot by police, further examples of the longstanding pattern of disparate, unfair treatment of black people. These are not isolated examples. This violence is upsetting and unacceptable. All of us must bear witness and speak up against it. 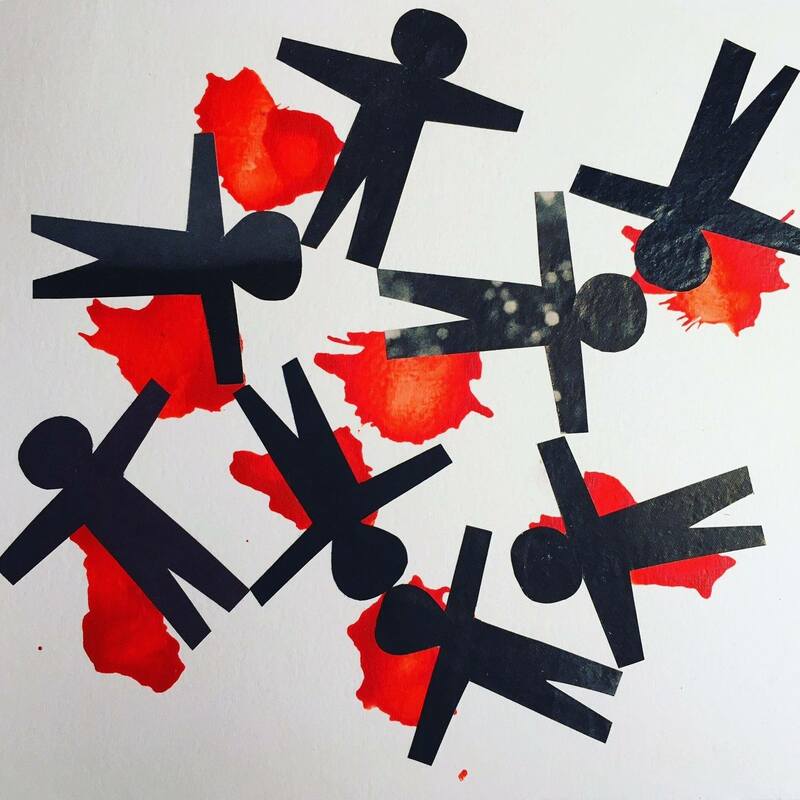 I am honored to share this painting by Christian Robinson, in response to these tragic events. It is essential that we recognize the injustice, to add our voice to the outrage caused by this violence. It is even more important that we take time to listen to people of color and honor their experiences, their feelings, their voices. We must listen to friend, to authors, to our students when they talk about the impact that these events have. Jason Reynold's poem "Machetes" reverberates in my heart and soul, especially this week. He wrote it for and read it aloud during the Coretta Scott King Book Awards last month in Orlando, FL. Please read it in its entirety and listen to Jason perform it with powerful, raw emotion. My personal mission is to share books that build children up, that help them see that they are strong, that they are loved, that their imaginations can help them soar. My student Mahari, an African American 5th grader, loved reading Adam Gidwitz's fantasy novels, A Tale Dark & Grimm, In a Glass Grimmly, and The Grimm Conclusion. Mahari also championed Kekla Magoon's fantasy novel The Shadows of Sherwood, with its strong girl protagonist Robyn, who is of mixed race. Perhaps these books were just escapism, but I'd argue that these fantasy novels gave him strength, gave him a belief that he had inner strength, like the main characters, as he faced challenges in his own life. We must give students a full range of characters, so they can see themselves in the books they read and walk through the doors to many worlds. To be an effective educator and a just member of society, I must bear witness to the devastating impact of institutional racism and poverty, especially upon children who deserve to soar. Part of this is entering difficult conversations and listening to my students. As a librarian and book lover, this means I work extra hard to find stories that reflect the experiences of people of color. This means I work extra to include, draw in and listen to my students of color. As educators, we must listen to our students, honor their voices and their lived experiences. We can help all of our students identify the causes of injustices, and support them as they write about, talk about, think about how they want to change the world.